Costa-Gavras (short for Konstantinos Gavras; Κωνσταντίνος Γαβράς; born 12 February 1933) is a Greek-French film director and producer, who lives and works in France. He is known for films with overt political themes, most famously the fast-paced thriller Z (1969), but he has also made comedies. Most of his movies have been made in French; however, six were made in English: Missing (1982), Hanna K. (1983), Betrayed (1988), Music Box (1989), Mad City (1997) and Amen. (2002). He produces most of his films himself, through his production company K.G. Productions. 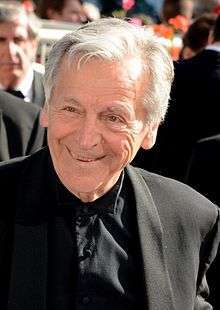 Costa-Gavras was born in Loutra Iraias (Λουτρά Ηραίας), Arcadia. His family spent the Second World War in a village in the Peloponnese, and moved to Athens after the war. His father had been a member of the Pro-Soviet branch of the Greek Resistance, and was imprisoned during the Greek Civil War. His father's Communist Party membership made it impossible for Costa-Gavras to attend university in Greece or to be granted a visa to the United States, so after high school he went to France, where he began studying law in 1951. In 1956, he left his university studies to study film at the French national film school, IDHEC. After film school, he apprenticed under Yves Allégret, and became an assistant director for Jean Giono and René Clair. After several further positions as first assistant director, he directed his first feature film, Compartiment Tueurs, in 1965. His 1967 film Shock Troops (Un homme de trop) was entered into the 5th Moscow International Film Festival. In Z (1969), an investigating judge, played by Jean-Louis Trintignant, tries to uncover the truth about the murder of a prominent leftist politician, played by Yves Montand, while government officials and the military attempt to cover up their roles. The film is a fictionalized account of the events surrounding the assassination of Greek politician Grigoris Lambrakis in 1963. It had additional resonance because, at the time of its release, Greece had been ruled for two years by the "Regime of the Colonels". Z won the Oscar for Best Foreign Language Film. Missing, originally released in 1982 and based on the book The Execution Of Charles Horman, concerns an American journalist, Charles Horman (acted out in the film by John Shea), who disappeared in the bloody coup led by General Augusto Pinochet in Chile and backed by the United States in 1973. Horman's father, played by Jack Lemmon, and wife, played by Sissy Spacek, search in vain to determine his fate. Nathaniel Davis, US ambassador to Chile from 1971–1973, a version of whose character had been portrayed in the movie (under a different name), filed a US$150 million libel suit, Davis v. Costa-Gavras, 619 F. Supp. 1372 (1985), against the studio and the director, which was eventually dismissed. The film won an Oscar for Best Screenplay Adaptation and the Palme d'Or at the Cannes Film Festival. In Music Box (1989), a respected Hungarian immigrant (Armin Mueller-Stahl) is accused of having commanded an Anti-Semitic death squad during World War II. His daughter, a Chicago defense attorney played by Jessica Lange, agrees to defend him at his denaturalization hearing. The film is inspired by the arrest and trial of Ukrainian immigrant John Demjanjuk and screenwriter Joe Eszterhas' realization that his father had been a member of the Hungarian Arrow Cross Party. The film won the Golden Bear at the 40th Berlin International Film Festival. La Petite Apocalypse (1993) was entered into the 43rd Berlin International Film Festival. Amen. (2003), was based in part on the highly controversial 1963 play, Der Stellvertreter. Ein christliches Trauerspiel (The Deputy, a Christian Tragedy), by Rolf Hochhuth. The movie alleges that Pope Pius XII was aware of the plight of the Jews in Nazi concentration camps during World War II, but failed to take public action to publicize or condemn the Holocaust. Apologists for the Vatican's role during World War II have cited Pope Pius XII's 1942 Christmas address as evidence that the Papacy and the Roman Catholic establishment did indeed condemn Nazi genocide but the relevant passage (a single short paragraph) in this address is so vague, obfuscated and non-specific as to offer little support for this claim. These issues continue to be disputed, with the Vatican thus far declining to open to historians all of its archives relating to the extent of the Pope's knowledge during World War II. Costa-Gavras is known for merging controversial political issues with the entertainment value of commercial cinema. Law and justice, oppression, legal/illegal violence, and torture are common subjects in his work, especially relevant to his earlier films. Costa-Gavras is an expert of the “statement” picture. In most cases, the targets of Costa-Gavras's work have been right-of-center movements and regimes, including Greek conservatives in and out of the military in Z, and right-wing dictatorships that ruled much of Latin America during the height of the Cold War, as in State of Siege and Missing. His accounts of corruption propagated, in their essence, by European and American powers (Z, State of Siege and Missing) highlight problems buried deep in the structures of these societies, problems which he deems not everyone is comfortable addressing. The approach he adopted in L'Aveu also "subtly invited the audience to a critical look focused on structural issues, delving this time into the opposite Communist bloc." Costa Gavras never worked in Greece and never made a film in Greek language. He received the Magritte Honorary Award at the 3rd Magritte Awards. He is a first cousin of recording artist Jimmie Spheeris, filmmaker Penelope Spheeris, and musician Chris Spheeris. His daughter Julie Gavras and his son Romain Gavras are also filmmakers. He is a distant relative of actor Jordan Gavaris who is best known for Orphan Black and Jasper Bartlett on the action/adventure series Unnatural History for Cartoon Network and in his latest film, The Sea of Trees. ↑ Maya Jaggi (2009-04-04). "Interview: Costa Gavras". London: The Guardian. Retrieved 2011-10-28. ↑ "Biographie et Filmographie de COSTA-GAVRAS - Ciné Passion". Cinemapassion.com. Retrieved 2011-10-28. ↑ "The 42nd Academy Awards (1970) Nominees and Winners". oscars.org. Retrieved 2011-11-16. ↑ "Berlinale: 1993 Programme". berlinale.de. Retrieved 2011-06-05. ↑ Crousse, Nicolas (January 10, 2013). "Les Magritte fêteront Yolande Moreau et Costa-Gavras". Le Soir (in French). Retrieved January 10, 2013. ↑ "Costa Gavras". Biographicon.com. Retrieved 2013-02-22. Wikimedia Commons has media related to Costa-Gavras.